Conversations in financial services are complex. On one hand, agents have to ensure customer satisfaction in conversation to secure loyalty. On the other, they are driven by their KPIs, dictated by business goals. All the while, each conversation is subject to extensive rules and regulations that could be detrimental for the business if not followed. So much has to go into each interaction that not all boxes are always ticked, resulting in potential loss in revenue opportunity, non-compliant conversations or low customer satisfaction. 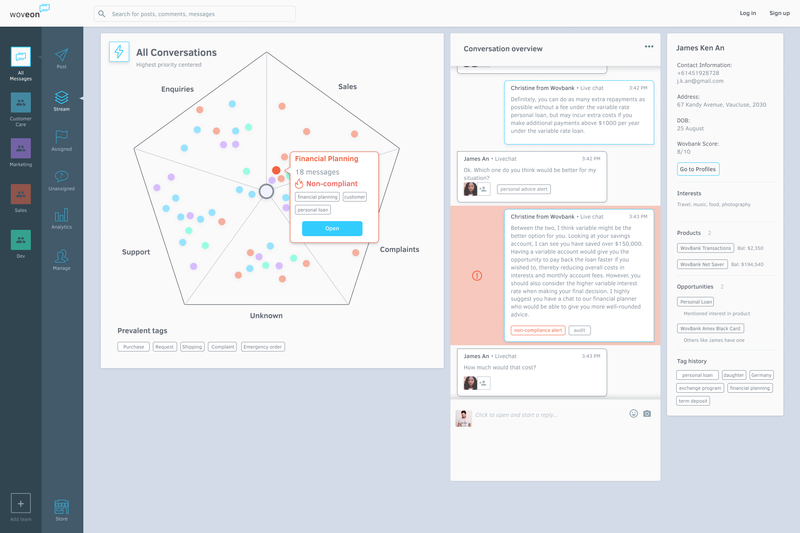 Woveon financial services software solutions is an AI assistant to agents, ensuring conversations deliver customer satisfaction, compliance and revenue. 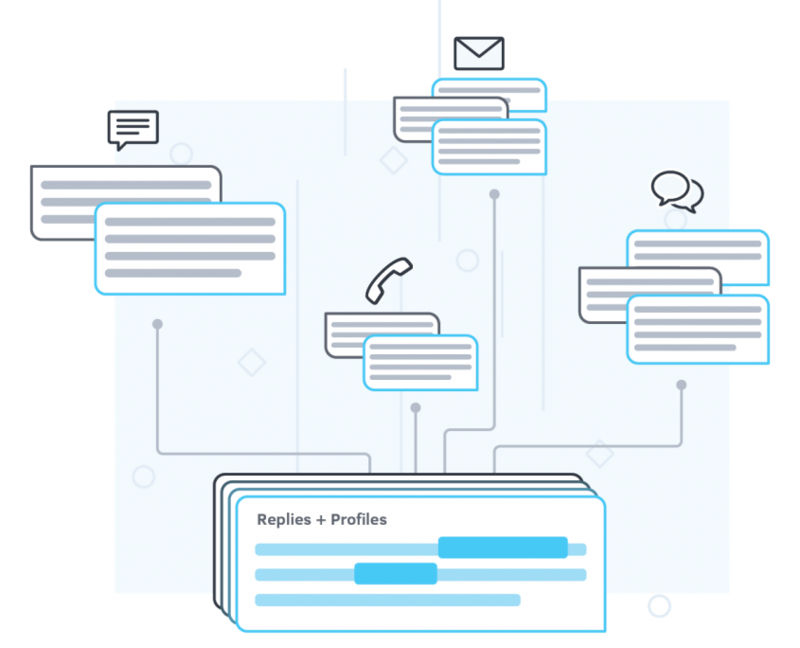 Woveon’s intelligent response framework provides agents with suggested responses – reminders to seize customer opportunities and real time flagging of non-compliance in conversations. 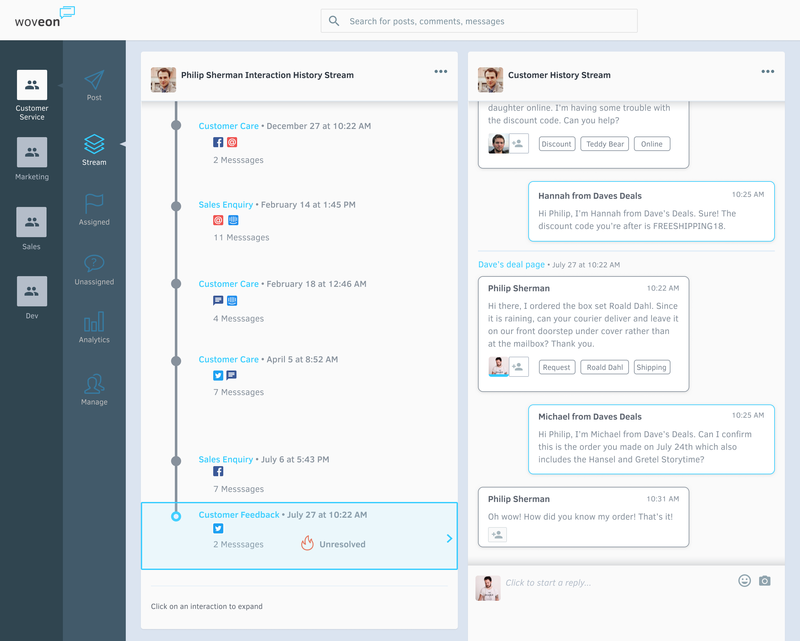 Woveon learns to create conversation flows, making sure customers reach the right people and can be trained to automate these flows so agents are free to focus on more crucial work. Mitigate and manage your compliance risks in real-time. Speak to a financial services software conversation expert. While financial services interactions are recorded and saved for quality assurance, it’s not possible to audit all of them without missing some non-compliant conversations. It’s those that fall through the cracks that become headaches, resulting in severe financial penalties. Woveon financial services software actively listens to conversations and flags any that might cause headaches — non-compliant interactions, security breaches and fraudulent behaviors. Agents will be notified of the red flags in real-time, allowing them to mitigate risks and reverse any damages. There is basis for why so many customers are frustrated with the support in the financial services industry. It’s clunky, full of repetitions and long wait times. Woveon can act as a digital concierge for financial service customers, navigating them through different departments, while making sure all their details are passed on to the next professional to avoid repetition. 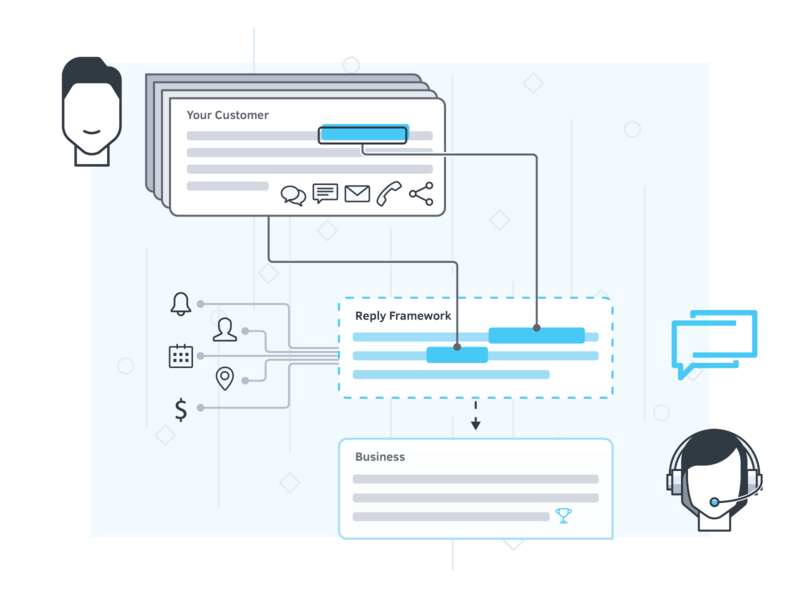 Having connected up customer data systems and channels, Woveon can easily cross systems and update the relevant customer detail as the conversation continues with little agent intervention.